RHYS BOWEN: When I met fellow writer Mary Kennedy I was instantly drawn to her new series because it's all about the interpretation of dreams and a Dream Club. I've always been fascinated by dreams and was hooked when I did a course on dream psychology when I was studying at the University of Freiburg in Germany. And I put this knowledge to good use when I wrote my upcoming Molly Murphy book called THE EDGE OF DREAMS. The story hinges on understanding a young girl's vivid dreams after a horrible crime, thanks to Professor Freud's recent treatise on interpreting dreams..
Dreams are amazing, ephemeral and fun. As a psychologist, I enjoy listening to my clients’ dreams and I’m grateful to have a window into their world. Their dreams teach me so much about their unconscious fears and desires, their most hidden emotions. When I read about the popularity of dream clubs in the northeast, I thought it would be a great idea for a mystery series and I wrote Nightmares Can be Murder, the first in the Dream Club Mysteries (Penguin, Sept 2,2014). Are dreams really the “royal road to the unconscious,” as Freud suggested? Can they give us insight into our deepest thoughts and unspoken wishes? Or are they simply random firings of neurons as the brain rests and recharges itself, processing the day’s events? Do the dream club members really uncover clues in their dreams that expose the killers? Or are they just lucky coincidences? I leave it to the reader to decide. RHYS: And Mary will be stopping by to chat and will give away a copy to one lucky commenter today. The idea of a group of people getting together to discuss their dreams is quite intriguing. But what happens to those of us who seldom remember their dreams? Mary, your "Nightmares Can Be Murder" is definitely going to find a spot in my teetering to-be-read pile . . . . Sounds like a fun series. It's on my t-b-r list. Any lucid dreamers in the club? That could add a layer of intrigue to the mysteries! Definitely sounds like a fun read--adding to my Christmas list. FChurch, funny you should dask about lucid dreaming. I've been researching it for a new book. Can you do it? Hallie, yes, I've always been a lucid dreamer--I've been conscious of my dreams as early as I can remember--also have had dreams within dreams within dreams--rare--and hard to wake up sometimes! I probably should know this, but what is a lucid dreamer? And Mary, I'm in awe of all you do, still practicing psychology and writing books too! How do you manage your time?? Lucy/Robertaa, a lucid dreamer is someone who is aware that they are dreaming as the dream is ongoing. I met a cat I'd like to add to my one-cat household--a sweet, well-mannered shy little girl-a stray like my Murphy. But I think 2 cats would be my own limit. Heh, I'm not sure I want to know the meaning of some of my dreams (buying tires at the McDonald's drive through from one of my son's TKD instructors? Tell the same instructor I can fix the screw holding his shoulder together with my new sonic screwdriver?). Hi Joan, sometimes it helps to keep a pen and paper on your night table and try to capture a dream as soon as you wake up (even if it's the middle of the night.) I have quite few clients who tell me they don't remember their dreams but they admit that sometimes a word or phrase brings it back and they recall the dream. Don't know if this has ever happened to you, but I've experienced it myself. It's interesting because it tells me the dream was always "there," but I just couldn't access it until the next day. Hi Hallie, I can't do lucid dreaming but I have a few clients who are troubled by nightmares and they have somehow "taught" themselves to do it. They are so eager to escape the terrifying visions that they manage to tell themselves, "This is only a dream. I can wake up whenever I want, or I can sit back and watch this as if it were a movie." It's a fascinating topic. People with sleep disorders often have waking states and sleep states intertwined when they undergo sleep evals in the hospital. The two states are intertwined like figure 8' when you read the print out. Looking forward to your next book! Hi Lucy, My long-suffering Brit husband swears I go "looking" for stray cats. I don't. I swear! They turn up in my yard one by one (well, one turned up pregnant with 5 kittens) and I take them in. He's just as much of a sucker for needy cats as I am, though. The cats are my "expensive hobby." Sigh. Happy release day for DEATH AND ALL the TRIMMINGS. I am a huge of the Key West Food Critic Mysteries! Mary Sutton, no worries, you can put whatever interpretation you want on your dreams. Last week I had two clients who reported very similar dreams--and they each put a completely different spin on them. Interesting! Thanks for stopping by. I have very vivid dreams and yet can barely remember them once I start to wake up. My partner will wake up from a dream and poke me till I'm conscious enough for her to tell me what it was, at which point I drop back to sleep. Nora, are they "good" dreams or nightmares? It might be interesting to keep a dream diary. Thanks for stopping by. What an interesting concept for a series. You're in uncharted territory. But otherwise, I have quite complex stories going on and I wake up say "whattheheck?" I'll be checking out your webpage/book asap. Good to see you here! B Paysor,that's a really interesting dream and I'm glad you managed to get it down on paper. It's strange how people pop up in dreams even when they're not part of the action. I guess the key would be to go after the emotion you were experiencing during the dream. That's one of the best ways to determine whether or not the dream was significant--try to look past the details to the underlying emotion. One of my professors (who was very Freudian) taught me that, and I think it was good advice. Thanks for stopping by. PK--I think many of us have the school/exam can't find the room panic sort of dream. I do. Also packing to catch a flight and I can't find my clothes dream. PK, the dreams you're describing seem to be classic anxiety dreams. Being faced with a "task you can't handle," feeling overwhelmed, etc etc. I hope you keep a dream diary, it would be interesting to see if these dreams are related to any stressors in your life. Thanks for stopping by! Oh, I miss being part of a dream group -- we all moved away. Reading about one may be the next best thing! And Joan, I've always found that my dream recall improves tremendously when I make a point of writing my dreams down in the morning. A group improves recall, too! A variation of lucid dreaming is to ask for a particular insight in your dreams. I've done it several times. My hunny asked to be shown a particular scientific / medical principle he'd been struggling with, and in the morning, he knew exactly what to do -- drew the design for a medical instrument he then built and still uses! I've always been curious about what my dreams might mean. It would be fun to discuss them with others. Thanks for the contest. Dreams are very interesting. Sometimes they seem so obvious and other times they leave that "what on earth was that about" feeling. Hi Mary! What a fun concept for a series! I have occasionally had lucid dreams, and those are the ones I'm most likely to remember, but I've never made much effort to analyze them. I do find that when I'm writing and I go to sleep thinking about a particular problem or scene, I often wake up with the answer. Thanks for the reminder to make use of that more often! Hi Mary! Hi Rhys! I wonder if we'll start seeing dream clubs pop up all over the place now? I'd go to one! I still remember some recurring dreams from my childhood and some extremely vivid nightmares as an adult. Usually, though, I'll wake him remembering just bits and pieces of whatever I was dreaming about. Very frustrating, especially if it was a good dream! My daughter has read some books on dream analysis. I never have. I'm pretty sure mine are just weird. I'm looking forward to more books in this series, Mary! I first became a fan of Rhys Bowen when I devoured the whole Evan Evans series some time ago. I was so sad when it ended, but was thrilled to find that it wasn't the only series Rhys had written. Now I want to read the new middle grade book - I'll have to read faster! Welcome, Mary! A dream group sounds amazing. OK, I've never heard of lucid dreaming before -- sounds amazing. FChurch, have you always been able to do it? Also, Hallie, what a great idea for a book! I vaguely remember some of my early dreams as a child: I couldn't speak. And they may have been in black and white. Then color came and someone hit the mute button again so I could talk. Weird, huh? Maybe that is typical for a child of the 50's. I have the classic anxiety dreams from time to time. Occasionally I'll dream something that is pure entertainment that I can just "sit" back and enjoy. But I've never had the flying dream. Too anxious? Sometimes when I wake up I have pretty much forgotten what I was dreaming about, but when I'm about to go to sleep again that night little glimpses of that dream pop up. I don't have that dream again, just a brief reminder of it. Anyone else have that happen? Hi Rhys, yes, those are classic anxiety dreams. It's interesting that there are universal "distress" signals in our dreams. Pat it's interesting that you can sit back and enjoy certain dreams because that certainly sounds like lucid dreaming. Also interesting that you went from black and white to color! Sounds like a great book. Definitely on my to be read list. Hi Susan, no, I have to confess, I've never been able to master lucid dreaming. I think it takes a certain skill, a certain mindset, I'd love to be able to do it. Thanks so much for stopping by. Hi Beckie, I'm so happy that Rhys has another Molly Murphy book in the works. I'm going to buy it the second it comes out. I don't think your dreams are "weird," just interesting@! Deborah, I think dreaming (or at least being in a deep sleep) is great for problem-solving. Like you, I often find the answer I've been searching for when I wake up. Thanks for stopping by. Hi Clickner, thanks for stopping by. The next book in the series DREAM A LITTLE SCREAM, is already up on amazon and available for pre-order. Susan, yes, always. Mary might know more about this, but there's been some fascinating research in the last decade or so on the brain/mind, using technologies such as the MRI--when researchers can ask subjects to do or think something, visualize something, and map the brain's response in real time. One theory of mind research suggests that there are different 'consciousnesses' within our minds. Like having two eyes send images to the brain, which then converges them into one--it may be that these different consciousnesses converge into the one we think of as our self. So maybe there's a part of my brain--a different consciousness--it nudges me and says, 'hey, look at this! Interesting dream, huh?' And I can change the dream if I choose, watch it play out, wake myself up, etc. Leslie, that's a fascinating idea, to ask for a particular image and have it appear. That's terrific that you used to be part of a dream group. Libby, I know what you mean, I've had those "Yowsers! What was all that about?" feelings, too. Thanks for stopping by. Sorry for the gobbledegook pasted above. It's called DREAM INTERPRETATION, a psychologist's guide and here's a shorter link. Sorry about that. It's the holidays. Mary, I have got to purchase your book, as I have so intrigued by dreams, especially the recurring ones. I'm usually pretty good at remembering my dreams and can often pinpoint why I was dreaming what I did. However, I also have really bizarre dreams that while they don't seem to make much sense, they are interesting to mull over. I have had lucid dreams, but the most disturbing sort of lucid dream I've had is the paralytic dream. Are you familiar with these, Mary? Anyone else? I haven't had one in quite a while, but essentially, I am lying in bed unable to move, knowing it's a dream, but I can't wake myself up or move my limbs. Sometimes I would imagine myself moving through the house investigating some unknown danger, but then I found myself back in bed, knowing that I hadn't really gone anywhere because I couldn't move. It came as a great relief when I could finally break this bond. The recurring dreams are, I'm sure, more common to all. Failing classes in school and it's the end of the term (which is especially distressing since I was at the top of my class in high school where the dreams usually are set), can't access the phone part of my cell phone to call someone, going to my car in a parking lot only to be unable to find it where I left it and thinking that I could go on and pretend to be driving and the car will appear under me (lucid dream). Oh, and there is the one where my husband has talked me into selling our present home and move to somewhere that I regret. I always want to go back to our old house. As you can see, Mary, dreams really do fascinate me. I know your series is going to be one I will thoroughly enjoy. Kathy, what you're describing is sleep paralysis and it's terrifying, I've had it myself. Not many episodes, but a few. Google the term to learn more. It often runs in families and seems to be more common in females. It is truly terrifying and similar to "locked-in" syndrome--except people with locked-in syndrome" never get better and sleep paralysis is temporary. There was a new study on it's caused by a "glitch" in the brain. The normal paralysis that accompanies REM sleep occurs as the same time as consciousness, so instead of being blissfully aware that you can't move (which is the way things are meant to happen)(, your brain is awake and can observe that your body is paralyzed. Truly terrifying. People with sleep paralysis sometimes try to open their mouth to vocalize but no sound comes out. It is a horrible experience. Sorry you are going through this. Oops, meant to say "instead of being blissfully unaware that you can't move... etc..."
This is a mystery series idea that I wish I'd come up with. I grew up with Jung's MAN AND HIS SYMBOLS on the bookshelf right next to the Bible. (Tells you something right there -- the Bible was just another book on the shelf, albeit on the shelf of my dad's "important" books). I do believe that dreams mean something and that there's a collective component. How else to explain that so many people have the same types of anxiety dreams, for example? Falling, being naked in public, etcetera. That's alot to think about...dreams. Unfortunately, I have to run errands, etc. Thanks for housework confession. It is hard to keep up with it in a multicat house...barf here,fur there...cat litter. That's a good idea, a group that discusses dreams and solves murders. Hi Lisa, I wish I'd taken more classes on Jungian theory when I was in grad school. There were so many required classes, I never seemed to squeeze in a class on Jung and archetypes, it would have come in handy for this series, thanks for stopping by! Mary, yes, the trying to vocalize goes with mine, too. I've tried to call my husband's name to help me, but I can't. I actually haven't had one of these awful episodes in a few years. I'm hoping that whatever caused them is gone. I will do as you say, though, and look it up on Google. Thanks. I keep dream diaries, and it is fun to go back and read over the dreams I had years ago. I still have a lot that I can not remember no matter how hard I try. Candace, that's terrific that you keep a dream diary. It's fascinating to look at your dreams over a period of times and see patterns. What was going on in your life at that time, etc. Thanks for stopping by! Hi Ronna, glad you are interesting in dreams, it's a fascinating subject, thanks for stopping by! Behind! Mary, sorry to be so late to the party! But this sounds fabulous. Hurray! An interesting, and certainly different, idea. I will have to check it out. Love the book concept! It's on my list of must get books now. I dream in color and rarely have a nightmare so am quite fortunate, I think. HI Susan, thanks for stopping by and happy dreams! Hi Carrie, glad there are no nightmares on the horizon for you, just sweet dreams! I have lucid dreams where I keep telling myself to wake up that it is only a dream. I have had a dream a few times where I know I need to breath and keep telling myself to breath, then finally I do breath and wake up. I haven't had those in a while. Most of my dreams involve the Schipperkes (dogs)...being late for shows, them getting loose, or dreams of those passed. I am a very vivid dreamer. I now will be adding your book to my TBR pile. Great idea for a plot.. Thanks so much Marlene. People who have vivid dreams are very creative types! They have a heightened sense of drama and this makes great dream material. Sounds like an interesting book. I think reviewers are saying it's a different hook for a cozy. 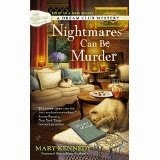 Congrats to Kathy Reel who won a signed copy of Nightmares Can Be Murder. Thanks so much to Rhys Bowen for having me on Jungle Red Writers, I really enjoyed it. Sweet dreams, everyone.